Greetings from edX! We’re almost halfway through the year, and have been hard at work planning and delivering improvements for our learners and course teams. Security is always a high priority at edX. To help protect our learners and their data, we’re exploring enhanced security requirements for learner passwords. In addition, we want to make sure our learners can find the courses they’re looking for. We’re currently looking into features that will increase search engine optimization (SEO) and lead learners to the right courses. To ensure learners have sufficient controls to modify their data preferences and protect their personal information, we are making changes to password complexity requirements. Look for this this change to be available to course staff later this month! We released platform-wide updates for the European Union General Data Protection Regulation (GDPR) that came into effect in May, including clarifying data policies and supporting account deletion. For more information, see the following posts on the edX Partner Portal. We’re excited to announce the latest version of our mobile app has been released for iOS and Android! With version 2.14 of the edX app, you can download the videos in a subsection instead of having to download either individual videos or all the videos in the course at one time. Additionally, video streaming quality now adapts automatically based on your network. 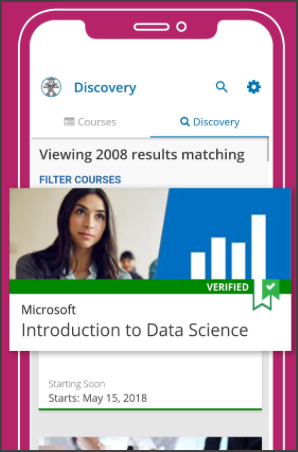 To help learners more easily find courses, we’ve also released an improved experience on the course discovery page. We’ve also added support for iPhoneX! We’ve released a vastly improved procedure for adding images to HTML components—right inside the HTML component itself, without having to upload files beforehand! For more information, see Add an Image to an HTML Component in Building and Running an Open edX Course. 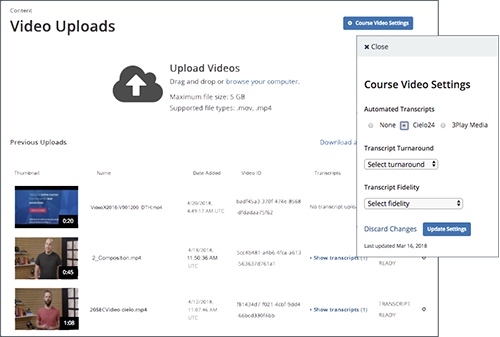 The Video Uploads page is enabled by default, and you can start uploading videos as soon as you create your course. No more confusing 15-step process before you can upload a video!Studio creates a default thumbnail image for each video automatically. If you want to use a different image, it’s easy to change it. You no longer have to keep up with a multitude of transcript files. For course teams who partner with 3Play Media and cielo24, transcripts—including translations of transcripts—are added to Studio automatically. The video player uses HTTPS Live Streaming (HLS) to play each video at the best speed for each learner’s internet connection automatically, checking every few seconds to make sure the video is playing well. We’ve dropped full support for YouTube videos in new and rerun courses. You no longer have to set up a YouTube account and channel or keep up with changing technology and requirements! Note that active course runs can still push videos to YouTube, and you still can add YouTube links to the video player in all courses. For more information about this new process, see Video Process Overview and Integrated Transcripts in Building and Running an edX Course.